Intel’s Wireless Display fills the big gap in my Windows Media Center home theater experience. 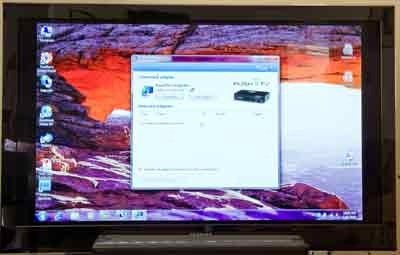 This technology, first demo’d at CES 2010, may be one of the bigger successes in the HTPC and networking arenas as new computers (currently only laptops) hit the market with the Intel 2010 i3/i5/i7 processors. 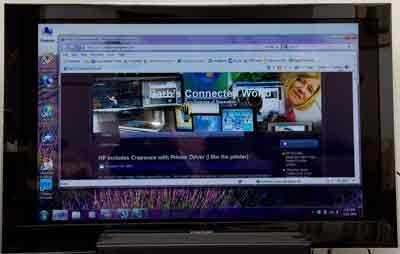 In a nutshell, I can use a laptop computer with an Intel i5 processor, Intel’s embedded graphics chip, Intel’s 6200 WiFi adapter, and a Netgear Push to TV bridge. So why is this such a big gap filler for me? My current home theater setup includes V2 Media Center extenders connected to the three HD TV’s in my home, with the Media Center desktop residing in my loft home office. 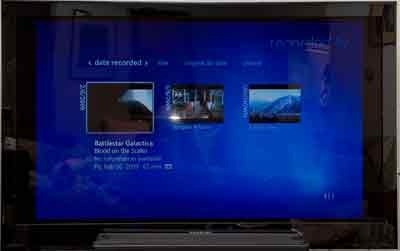 What I can’t get with this set up (without buying a PC and connecting one to every television) are all the Internet based Media Center extra’s such as Internet TV and Netflix. Problem solved. With WiDi, I’ve got a nice, light (4.2 pound) 13.3 inch widescreen laptop to use anywhere in my home, around town, or on the road AND I’m able to display all of these Media Center extras. I gain the ability to browse the web and display anything I want on my TV’s. The technology is nearly idiot proof. 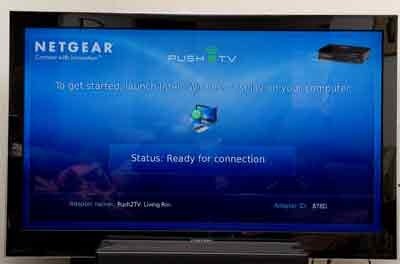 Connect the Netgear device via the included HDMI cable. Hit the special button on the laptop keyboard and enter a 4 digit code after your device is found. All the networking setup is handled without user intervention. WPA2security is configured via WPS (wireless provisioning services) behind the scenes to secure the Personal Area Network (PAN) connection between the laptop and the PTV device. An ICS connection to the Intel internal WiFi is also established behind the scenes. You won’t see this in any of Windows 7’s GUI’s or discover it with netsh, but it is present. In fact, while the 6200 Intel NIC is a/b/g/n capable, when using WiDi with the Netgear device, it is not possible to connect to the 5GHz radio in a dual band router. An error message is returned stating only 2.4 GHz is supported. Some additional good news, even in my overly saturated 2.4 GHz environment of 19 different SSID’s, I had absolutely no interference. Internet TV (the missing piece in my home theater experience) in Windows Media Center looks good. Streaming Star Trek from Windows Media Center via WiDi. 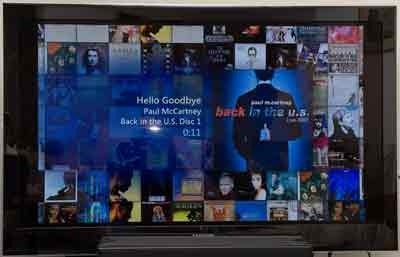 Anything I want using the Media Center interface is streamed to the connected TV, music.. pix… videos.. Anything displayed on your desktop can be streamed. Want to read email? Use Windows Live Messenger? Participate in newsgroups or forums? Browse the web? Yep, it’s in there. And for me, there is another huge gap filler. My main beef with Windows Media Center Internet TV is the lack of HD content. With a 52 inch state of the art 1080p TV, can you blame me for wanting HD streaming? Here’s the good news. If one of the networks or other source offers an asset in HD for streaming, WiDi handles it effortlessly. 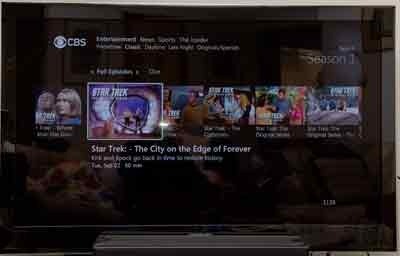 As shown earlier in this post, Windows Media Center Internet TV offers a large amount of CBS content, including (at least at the present time) all three seasons of Star Trek, the original series. 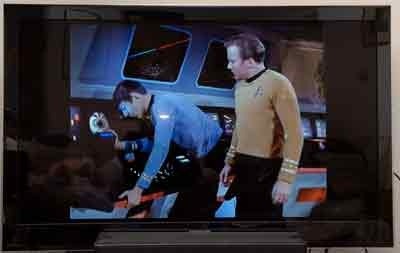 Inside Media Center, only SD is available, but I can navigate to the CBS website and view the remastered Star Trek original series in glorious full screen HD. Needless to say, I’m a very happy camper these days. This entry was posted in Uncategorized and tagged Intel Wireless Display, Internet TV, MCE, Media Center, WiDi, Windows Media Center. Bookmark the permalink.